1. Why a lack of structure, relentlessness and persistence caused Dominey to spend 10 years thinking about starting a consulting business but never actually doing it. 2. How Consulting Accelerator helped Dominey make tough decisions, focus and commit to a niche and offer etc. 3. Why Dominey didn't take any shortcuts in the training and completed every single step and how that helped her channel her energy and focus into the right things. 4. Why it took 100+ strategy sessions for Dominey to master the process and her offer and why not giving up and constantly iterating is mandatory for success. 5. Why persistence and ruthless discipline helped Dominey scale to $20,000 /month and why this is the most important character trait you can possibly have in business. Push through and never give up! Sometimes it feels like you're not making any progress and not moving forward, when this happens you have to keep pushing and don't settle for anything less! How do you do this? You have to let go of the "big picture" and focus on implementing the daily actions. Professional mountain climbers always say: "Don't stare at the summit, focus on your feet and put one foot in front of the other". Sam Ovens:	Hey everyone, it's Sam Ovens here, and today I've got another one of our customers and that's Dominey Drew. And Dominey helps single men attract life partners through personal and relationship coaching. That's her niche and that's what she does, and Dominey joined Consulting Accelerator about one year ago now and at that time she had wanted to do this sort of work for about ten years, and she had the desire to do it, but she just hadn't implemented it and got it structured and got it actually happening. 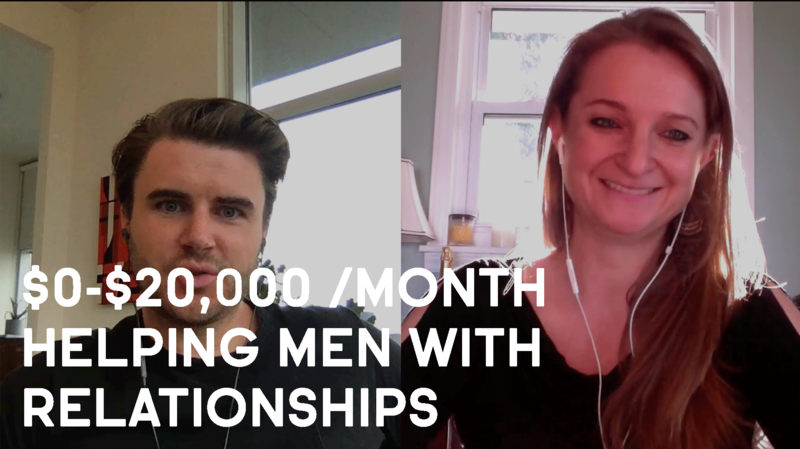 And she joined Consulting Accelerator, and she was able to actually implement this, turn it into a real business, and she's been able to grow it to the point right now where it's making around $20,000 a month, and it's growing quickly so I'm sure it's going to be beyond that pretty soon. So, how's it going Dominey? Dominey Drew:	It's going well, thanks for having me. Sam Ovens:	Awesome. Well why don't we start with, you know, what was your situation before you joined? Dominey Drew:	Sure. So, I was basically just a huge pile of frustration. I am the type of person I identified a long time ago that I really want to have a large impact on the world, as far as healing and coaching and guiding people, and I felt that very strongly for probably 15-20 years, and I've actually had the training to do it for about 10-15 years. But I couldn't get the business side off the ground, so I had the skill set and I would do it with my friends and I'm the type of person who I would sit down at a bar by myself and a stranger would come and be sitting next to me and we just started talking about issues. I guess generally men but men and women would sit there and start talking and within ten minutes they're saying things like, "I've never told anyone this before" and, "I can't believe I just said that to you." That type of thing. So I've always had this kind of knack to help people feel safe to kind of go into the darker places that they struggle to go, and just didn't have the logic side, the business savvy, to do it. And a friend sent me your link on Facebook, and it wasn't at that time I think it was probably several months later when I actually did something about it, but I just got this intuition. I was like, "Yep, this is how I'm going to do it." That tends to be how I make all my life decisions and this one came in very clearly. Sam Ovens:	Oh, and you said before the interview we were chatting, and you said you had wanted to do this for like 10 years but you didn't. So, what was stopping you? Dominey Drew:	So I had all of the passion and maybe even a lot of the drive, not quite the drive that turned into persistence and relentlessness, which I now have, but the drive as in the really strong desire, but no structure. So when I went to put my work out into the world, it just sort of spread like water across a plain, and what it needed was a ravine, like walls to guide it and actually concentrate that intention and that work to actually produce a result. I needed the structure to actually create the result I was trying to get without the structure. Sam Ovens:	Got it. What was the main reason that you were interested in joining Accelerator? Dominey Drew:	Well I wanted this work to be big. I wanted to be on a global level. I want to teach to huge crowds. I want to do retreats and workshops. I have big plans for the changes I can make. I've done it in the past, not on that kind of scale obviously because I didn't have the structure, but I'm confident in my ability to do the work and I just needed a way to get it out to people that I could understand. Sam Ovens:	Got it. And then, so what happened after you joined? What did that process look like? Dominey Drew:	Oh, it was brutal. It was really brutal. It was a lot of work. I don't think I've worked that hard on anything in my entire life. I had to niche down, which I sort of had to work with healer types, a fair amount of niching was very difficult because my heart was open and I wanted to help everyone. So I had to really niche, and also I took a long time. It was, I think it was probably spring when I bought the program originally, and what I needed up doing was I didn't launch ads until middle of October. So that's when I kind of ... And in my field, it was difficult to do organic, so I started with the ads. And that was in the end of, that was late October. So during that entire time, I was shaping the business. I was deciding what I wanted to do, who I wanted to help, what it was going to look like, writing the course, all this sort of thing. And I didn't take any shortcuts, I really didn't. I knew I didn't just want to start a business to make money. I wanted to start my business that was going to fulfill me, and I'm more motivated than by money in general. So every step I didn't go to the next video, sometimes I spent weeks on one video, refusing to move forward until I knew exactly, until I'd completed those instructions completely. Sam Ovens:	And what did that, what did the training really ... You said it was brutal. What was so brutal about it? Dominey Drew:	It was really hard to figure out, to narrow everything down from being so broad to being so narrow. I knew that it needed to be. You were sitting there on the video being like "You can't operate your business emotionally. You can't try and fix everything." Oh that's what happened. I think the first time somebody recommended you to me on Facebook, I went through the webinar, and you said, "The fastest way to mediocrity is to be a generalist." Which I thought was very well put, and it was mostly getting through that. Both narrowing down and figuring out what exactly I wanted and how it was going to work, it was incredibly tough. Sam Ovens:	So it was forcing you to make a decision really? Dominey Drew:	A lot of decisions. And to define some parts of who I am, which I just left vague. Sam Ovens:	Got it. I think people love to keep things open-ended, but that's also what they hate because it leads to nothing. Dominey Drew:	Yeah. Yeah, but it looks like you're leaving your options more open, so it's one of the more seductive images, mental [crosstalk 00:06:31] Sam Ovens:	Until you die, and you didn't achieve any options. Dominey Drew:	Right up until that point, yeah. Sam Ovens:	Cool. So, you had a hunch about what you wanted to do. Dominey Drew:	Mm-hmm (affirmative) Sam Ovens:	About how, and you said you were kind of, it was like water spread over a plain, and then the course helped you really get focused. How did it help you get focused? How were you broad before, and then the course helped you get narrow? Dominey Drew:	Well, the niche is a great example. I wanted to help everyone do everything, and that was made worse by the fact that my training can help anyone do anything. I can and have actually run the same process, as far as what I'm doing, to help people with their careers, because it's the same process mindset works, so it doesn't matter what your goal is I help people see how they're holding themselves back from what they want. So narrowing that down to choosing, okay I'm going to deal just with relationships. Okay, I'm going to deal just with single people wanting to find a relationship. Okay, I'm going to deal just with men. I wanted to micro-niche, micro-niche, micro-niche. And that's why I landed in working specifically with men, and there's also a lot of support out there for women. A lot of people specializing doing things with women, and very few specializing in doing things with men. And I've always really felt that as a longing to work with men, so that was a bit of a jumping off a cliff for me too. And I've gotten a little bit of flack from it, actually around it, since launching the business, but that's okay. Sam Ovens:	How have you gotten flack? Dominey Drew:	People are surprised to hear that I work just with men. There are some indignant women who don't think that type of thing is a great thing, but I had a lot of sort of men also, a lot of men who are experiencing this guilt over their masculinity. And so they'll be like, "Oh, I can't believe you work only with men. What about women?" And I was like, "There's plenty of support out there for women. This is what I'm called to do and helping ... It's about sort of standing in your power in a healthy masculine way without being defended or aggressive." And it ends up being, it's very powerful. Sam Ovens:	Cool. Dominey Drew:	Yeah. Sam Ovens:	And then, so you were able to really pick your niche, which is helping men with their relationships. And you joined the program, you got really focused and everything, and then what happened? What was next after really getting focused? Dominey Drew:	Okay, so I got focused. I wrote my online course. I launched the ads and then a whole lot of nothing happened for a long time. I had the funnel since day one has worked brilliantly. It's way under KPI, everything's extremely affordable. I would get the strategy sessions and I couldn't book anyone. Anyone. Sam Ovens:	You didn't sell anyone? Dominey Drew:	Mm-hmm (affirmative) As far as on the actual strategy session. I spent a lot of time with Jessie, bless his soul. When we were trying to figure out, was it the tonality, what's happening, because everything else was just in line and just nobody was buying. So we adjusted a couple of things, and this took months. It was, let's see, I set a launch in October, November, December, so two and a half months of me just on every single call being like, "Okay, what. I tried it again, I tried what you said. What do I do now?" It was just every single time, because I was just refusing. That's where I found, this is I think the big piece for me in self growth is the persistence that I have found through this process has been, I would say, pretty life changing. Persistence is not usually something that's been a gift of mine, you know it's not something that comes naturally to me, but this one I was just like, "No. I'm going to do it, and I'm going to do it through Sam's way, and I'm not going to stop until it's I'm as successful as I want to be." So, it was still pretty uphill. I had a break in March actually. The beginning of March, March 7th actually, and that's when I made $22,000 in March and I didn't start until the 7th, so that's actually only in three weeks. Sam Ovens:	Nice, and what changed? Dominey Drew:	The energy I was in in the strategy session changed. I was doing everything right sort of by the book of what I was told, but I wasn't relaxing into it. So, my voice I think was, this is my best guess, my voice was coming off as being a little clinical and a little forceful, because I was focusing on the script, because I wasn't used to being a script. I also had major issues around selling and beliefs around that that I had to work through in the early days. My tone just got softer. I started actually really genuinely being interested in what the other person was saying, instead of sort of more being worried about taking them through the steps of the script. That's all. I really don't know. I really don't know. I didn't do much in February, I was away for a lot of the month and so when I came back I was just really ready to go and people couldn't book fast enough. Sam Ovens:	And you said, you had some fears and some stuff around money. What do you mean? Dominey Drew:	Yeah, around selling, around being salesy. It's something I struggled with for a lot of years, actually, feels completely now. I have no concern about it at all, but I did for many years and it wasn't so much a value thing as I didn't feel like I was worth it, it was more that I didn't think anyone was going to see that I was worth it. They weren't going to pay me, and also money was distasteful and not to be discussed and sort of things like that, just things I picked up when I was young. And it was major block from getting on the phone and actually talking to people. Sam Ovens:	Got it. So you were able to fix that up, and you're able to sell your program and you got to 22 grand in three weeks, which is pretty awesome. What were you able to sell your program for? What was your price initially? Dominey Drew:	Initially the price was $4,300 for an eight week course, and then we ended up lowering it. We lowered it to $2,800 so that's where it is now. That was one of the things we tried sort of when we tried everything else, we lowered the price. It did start creating some movement. Sam Ovens:	Cool. Yeah, I think initially sometimes there's what you think it's worth and you have to charge that price for the, like you said, the energy and your voice and everything to be smooth, and then as you put more people through it you start to see the results they get. Then your confidence in it goes up so you're able to move the price up and hold your same confidence there. Dominey Drew:	Yeah. [crosstalk 00:13:30] Sam Ovens:	Even some of our most successful people, like Andrew Argue, his price initially was $2,800 and that's where everyone really starts so there's nothing wrong with that. Dominey Drew:	It's a good spot. I was kind of glad we took it down. I felt better, as you said, I feel more confidence selling at $2,800 and now I feel like I could maybe start talking about going up a little bit and see if it's time for that, but I'm pretty happy too. Sam Ovens:	Cool. Then, what was, you know going through the program, what was the most transformational part of it for you? Dominey Drew:	I would say that was two-fold. One part would be, the structure that you came out, and not just the structure but the progression of structures, which you came up with for a consulting business. So right now, I'm looking to move into a group pretty soon, so I'm following the up level to sort of shift to that next step. But that whole not charging hourly, was huge for me. That it was sort of more value based and that there were sort of a way that you could help huge numbers of people at once. That's always appealed to me. So the one on one, I enjoy just fine, but what I really want to do is I want to teach to groups or I want to teach to big rooms to audiences or whatever. And I want to process and I want to do the work on a large scale, so that really appealed to me. And then the second was probably Facebook ads, which I had no experience of whatsoever. Pretty much everything was new to me, except the week two work, the mindset work, because that's my field. So actually I think that was a little less revolutionary for me than for a lot of people, but it was also accurate and I'm a little bit of a snob about it so I was happy to see that. Sam Ovens:	Cool. When you were, just thinking about your niche, you knew you wanted to help these men with their relationships, how did you really identify the problem? And what was the problem? Dominey Drew:	So my ideal client is sort of is between 40's-60's and you know they're over the dating scene. Sometimes they've just had that realization when they're not in their 20's anymore, and maybe it's not all going to work out in the future. All the way to they've been married five times and just can't seem to make anything work. They're really looking for something more serious. They're not interested in dating. They don't want to put the effort in. They want to have someone by their side so they can really get more out of life, and a lot of times they're looking at ending up alone if they don't fix their problem. Sam Ovens:	And what would you say is their problem? Dominey Drew:	So two things that I see most often, one is that they'll be underlyings subconscious beliefs that are projecting themselves without them realizing it, and keeping them single. And the other is that they'll continually attract the wrong relationship. So what they'll end up doing is there's some belief formed in childhood around, you know let's say people will always leave me, and they're carrying that around in their head, and then they're going around in life and they're making themselves right. But they don't know they believe that, right, they're like, "No, no people don't ..." They may not have even experienced abandonment in childhood, but it's in there, something put it in there on some level and then they go through their whole life and now they're 58 and they've been married four times and they're still single. So what we do is we work backwards. We find that underlying belief. Once it's conscious, I don't actually do anything. I don't advise my clients. I don't talk much during the sessions. I just ask questions and help them find it themselves, and then once it's conscious the whole game shifts. Sam Ovens:	Got it. Dominey Drew:	So I do most of my work underneath the surface, because that's where most of life, what you get out of life, happens and then part of it's like a practical; how do you go out and meet women? What's your approach like? Let's talk about that, kind of thing. Sam Ovens:	Cool, and how did you know that your niche was going to be willing to pay for your program? You'd found the niche. You'd found their problem. How did you know that they'd be willing to pay it? Dominey Drew:	I researched it. I read a lot of articles from people in that position to see what they were thinking. I watched a lot of videos. And I kind of drew from my own experience, you know the times that I've spent being single and lonely were extremely painful. If being in a relationship is something that you want and you're not, it's very, very painful. It's a pain point. Sam Ovens:	Got it. Dominey Drew:	Yeah. Sam Ovens:	Cool, and so I think we've covered most of those steps going through. What was the big thing that enabled you to get to like $20,000 a month? Because I'm thinking for people who are have got one or two clients and they're making like $2,000-$4,000, and they want to get to $20,000. How did you get there compared to just getting a couple of clients? Dominey Drew:	I'm not sure exactly what it is that made me break through in the end, but I will say that I got there because I was persistent. I just tried everything. I iterated, and iterated, and iterated, and I was incessantly in the Facebook group and I was talking to people in messages on the side and asking them what had worked and in contact with you and Jessie, and trying to figure out what I'd done wrong. And that approach, I was like it doesn't matter what I'm doing wrong I'm going to find it and I'm going to fix it, and I don't care how long it takes, was my approach. And I think that's ultimately what got me to $20,000 a month. Sam Ovens:	Relentlessness. Dominey Drew:	Yeah. Sam Ovens:	Cool, and you're like all in on this business too right? Dominey Drew:	Yeah. Sam Ovens:	I think that's a big one for people listening if they're like, "How do I get there?" I mean, you just gotta go all in. Dominey Drew:	Oh yeah, no. This is it. This is it. And I'm not even, you know as I said, so money motivated I'm like quality of life motivated and I still am not going anywhere or doing anything until this is where I want it to be. I mean, this is my life's work right now, or the start of it. Sam Ovens:	Awesome, and so what is your big goa and vision for what you're doing? Dominey Drew:	I want to teach globally. I imagine I'll probably write a couple of books. I think that'll probably happen sooner rather than later. But really, I want to teach. I want to run retreats, run workshops, and teach to large audiences. Sam Ovens:	Cool. Dominey Drew:	Yeah. Sam Ovens:	And so where do you want to grow the business to by the end of this year? Dominey Drew:	I think I'd like to, I'm estimating that I'm going to need to hire someone in about two months or so. So I imagine that by the end of the year we may have needed to hire another person. So if that's the case, I'd like to have two employees and be at about 1 million a year. Sam Ovens:	Cool, and what's stopping you from getting to a million a year? Dominey Drew:	Nothing. I'm on my way. This interview, otherwise I'd be on a strategy session. Yeah, not a thing. I'm accelerating. I'm moving forward. I'm on my way. Sam Ovens:	Cool. Dominey Drew:	Yeah. Sam Ovens:	And what are the next two hires you're thinking? Dominey Drew:	So I need someone to do sales calls and then I actually don't know what this next second hire is after that. I was thinking about moving the person I was having do sales calls initially into part-time helping me work on the business, so they did half and half, and then hire another full sales call person, but I was going to ask you. Sam Ovens:	Sales person, and keep them pure. Dominey Drew:	Okay. Sam Ovens:	Yeah, it's hard to have a split focus in anything, you know? Yeah. And then I'd get another sales person, and then I'd get someone for your Facebook ads. Dominey Drew:	Ah, okay. Sam Ovens:	Yeah, 'cause once you've got someone managing your ads, and then you've got a couple of people doing your calls, then you can focus purely on just running the business, making the decisions, improving the program, things like that. Dominey Drew:	Got it. Sam Ovens:	When you get a couple of reps and someone doing your ads that's when it'll start going right up. Dominey Drew:	Okay. Sam Ovens:	Yeah, 'cause I mean the main objective is generate strategy sessions, do strategy sessions. So that's like a Facebook person, generating them, and then a sales reps doing them. Dominey Drew:	Ah, okay. You've hired out the two most important positions. Sam Ovens:	Only once you've mastered it, like if you try and hire those people when it doesn't work you're going to scale your problems. Dominey Drew:	Yeah. Sam Ovens:	So, quite literally scaling issues, which is not what you want to do. So once you've figured out how to make the ads work and you've mastered the call and you've got recordings and all of these, and your conversion rates nice and high, then you can teach it to other people and get them to do it. Dominey Drew:	I tried to sneak that one around Jessie for quite sometime, 'cause I was failing miserably at the strategy sessions but everything else was great, and I was like, "So, if I hired someone..." He was like, "No." And he's right, and now it's repeatable. It's regular. My conversion rates in the 60's and it's like, okay lets ... Now I think we can start having that conversation. Sam Ovens:	Yeah, even for up level, like the new version, which I just released, I went back and did all the course myself. The first 25 sales calls, I did them all myself. And only once I had figured it out and mastered it, I then was like, "Alright Jessie now you can go in and do them", because otherwise I would not know what standard to hold him to. I wouldn't know how to ... Now what we're doing is we're, I've got all of my recordings and I know what my conversion rate is, and then we've got Jessie's recordings and then I get Nick Houser to listen to his and mine and compare them, so that Jessie can learn off of that. Dominey Drew:	Interesting. Sam Ovens:	So when you hire your next rep, you'll get, when you hire your first rep, you'll get them to shadow you for a bit first, listen to all of your calls for like a week just with you. And then when you're talking to people on the phone you can mute it while they're speaking and then talk to them and say this is what's going on here, here, here and then get them to do some calls with you, when you're watching them. And then just constantly get them to record their calls, and listen to them and then compare them to your recordings. It's so easy to learn, because you've got so much material to learn from. You know what I mean? Dominey Drew:	Mm-hmm (affirmative) Sam Ovens:	Yeah. That'll be awesome once you get that. There's nothing more freeing than getting sales calls off your plate, and having the sales person actually match your performance. Dominey Drew:	That would be phenomenal. I was thinking it would be double because I figured I was going to be doing the same number of sales calls the whole time. Sam Ovens:	Well they should be able to match your performance, but do more calls. Dominey Drew:	Mm-hmm (affirmative) Sam Ovens:	Yeah, so they'll be able to like [inaudible 00:25:04] make more sales than you. Dominey Drew:	Okay, yeah 'cause I've come to the point where it's like I just get exhausted so I can do about six a day, which is about what I've had, I had seven for a long time but on average about six a day since I started my ads of strategy sessions. And I'm just exhausted, like by the end of the day it's focusing in that way for that amount of time. Sam Ovens:	But the things you learn on those calls is so valuable. Dominey Drew:	It's phenomenal, yes. And the information for what they're looking for in the program. Yeah, feedback is valuable. Sam Ovens:	And how many of the calls did you have to do before you got, in your mind, good at it and closing at decent rate? Dominey Drew:	Oh my god, an embarrassing number. Sam Ovens:	What is it? Dominey Drew:	An embarrassing number, I could look it up for you if you want. On average, roughly six a day from October to February. Sam Ovens:	Six a day, six. So what probably you were doing ... Dominey Drew:	So 30 a week, so 120 a month so probably 300. Sam Ovens:	Interesting. Dominey Drew:	Is that right? Sam Ovens:	Yeah, we find that most of the time people need to do at least like 60-90 calls to get pretty good, and then mastery comes from a lot. When I was able to start closing 40% and when Andrew Argue and them have been able to grow to a million a month, I mean we've all done probably 3,000 calls. I know after 1,000 a whole lot mastery come, but other people listening to that it's not like, "Oh, you have to do 3,000 before you get good." I mean after 100 you should be closing at a decent enough level. And what were you, were you listening to your recordings and studying how they were going and everything? Dominey Drew:	I was. I probably didn't do that as much as I should have. I probably did it two or three times rather than sort of making it a consistent thing, but I did take things away when I re listened to them again. Sam Ovens:	What sort of things did you, were you able to extract from them? Dominey Drew:	I noticed when I was speaking too quickly, as you can tell I speak rather fast, and I really had to focus on slowing down. It was tricky because you know when I'm in a healing session with these people I naturally slow down, and I naturally focus in, I probably do the exact same thing I'm supposed to do on the sales calls. But I'm really focused in and I'm really, I get in that space where I'm sort of open and I'm getting information about the person who's speaking or whatever, but on the sales calls it was like I had an agenda and I had to then let go of that agenda or kind of push it to the back so I could really focus on whether or not this client was actually good for my program. So all of these, you know I think just the selling thing came in and kind of messed up the dynamic. Sam Ovens:	It is like the, I think of the strategy session almost as like it's diagnosing. That's the best description I can give it. It's just trying to figure out what the hell is going wrong. Dominey Drew:	Yeah. Sam Ovens:	And once you can do that, then you know whether you can help them or not and then if you can then it's pretty much done. Dominey Drew:	Yeah, that took a long time to really slip into, because I was like you're just diagnosing and then I was like obviously you're not just diagnosing ... No you are just diagnosing, it was like, but I think again I think it was the negative side of, now it's like I don't think about it one way or the other I just get on the phone and I go, "Okay, what's going on. Gosh that sounds really hard. How does that effect on other areas of your life?" And find the cost of it and things like that, and I just move through it and then to the end there. Yeah, that sounds great. Okay. Sam Ovens:	Cool. Dominey Drew:	So it's been a whole 180. It's really quite incredible. Sam Ovens:	And so, if anyone is watching this interview that we're doing, and how will they know if they're a good fit for your services, 'cause I'm thinking there's probably going to be a lot of men who watch this and they might need relationship help, so how do they know? Dominey Drew:	Yeah, if there's anything, even if you're in a relationship and you've just got problems that keep iterating, anything that becomes a pattern, or you're in a relationship and you've messed up a lot of relationships before in the past and you don't want to mess this one up, or you're having a hard time meeting someone. Those are all patterns. So anytime you have a pattern in your relationship life, or you're struggling at all. It's definitely worth a call. Can't hurt. Sam Ovens:	And how do they find you? Dominey Drew:	I am at [email protected] and domineydrew.com is my website. Sam Ovens:	Awesome. Dominey Drew:	Yeah. Sam Ovens:	Cool, and you've been an Accelerator for a year now and you've been able to go from $0-$20,000 a month. What would your main piece of advice be for other Accelerator members? Dominey Drew:	Push through, don't give up. A lot of this, I'm sure you remember it feels like it's in your head. It feels like you're not going anywhere. It feels like you're not making progress sometimes, or there's no point sort of getting out the door. I had a lot of that analysis type of thing. Keep going. Keep being persistent. Keep putting the work in. Keep iterating. Keep fixing it, and don't settle for anything less. Sam Ovens:	And how can they develop that sort of, because it's one thing to say it and be like, "Alright, I'm going to do it." But how can they do it? Dominey Drew:	I remember that well. You know I'm a big picture person, and I think one of the things that helped me was letting go of the big picture and taking it step by step. Today, I'm going to get up and I'm going to do the exact same thing I did yesterday, which is something that's in itself very, very difficult for me. I don't like doing the same thing every day, and so taking the step and it feels like I didn't make any progress, but you know what I'm going to do the same thing again tomorrow. And I think it's progress and then three days with none, and it's like okay that's fine, and then a big burst happens. So it doesn't happen sequentially, you don't feel like you're getting better every day. You get better and then you get worse for two weeks, and then you get great for a day. The first time I had, I think I made I don't know, $9,000 in like two days, which is just absolutely unheard of for me. And then I spoke with Jessie and I was like, "Is this a fluke? Or is this just, I don't want to get attached to this but I'm excited." And it went up and it was sort of down for awhile and not it's, but the overall that's when the big picture is useful, is going up. Sam Ovens:	Yeah, I remember watching mountain climbing movies. I love watching those, because that's kind of what I think of myself and there's a common saying there, "Don't stare at the summit." Like when you're walking up, look at your feet. Focus on the next step. Dominey Drew:	Interesting. Sam Ovens:	Yeah, because if you just stare at the summit and you keep walking you feel like you never get there and you'll get so disheartened and you'll probably die. But when you just look at your feet and you just go like one little step, and these guys are moving slow man, 'cause they're wearing so much gear and they just "chip, chip, chip" but they get there. Dominey Drew:	Yep. Sam Ovens:	And that sounds like exactly what you said. You used to be fixated on the summit, and now you're looking at putting one step in front of the other. And that's huge advice for everyone in the program. Dominey Drew:	Yeah. Yeah, massive. Sam Ovens:	Well thanks a lot for jumping on and sharing your story. I'm sure it's going to help a lot of people in the program, and also if any dudes are watching this and they've got repeating patterns, you know what to do. Dominey Drew:	Brilliant. Well thank you for having me. I appreciate it. Sam Ovens:	No problem. Thanks. Dominey Drew:	Take care.